The biggest question people have when traveling to China during Chinese New Year is whether or not they're going to be able to do anything. Visitors worry everything will be closed or extremely busy and that they can forget sightseeing, shopping, and dining out. The good news is that for tourists, Chinese New Year generally won't be an inconvenience when it comes to touring and sightseeing. Almost all businesses related to tourism and the service industry, except for banks, will not close over the holidays. The flip-side of this is that offices and schools are closed for the holidays; lots of folks are traveling during this period. In fact, Chinese New Year is the reason for Chunyun, a record-setting travel period considered to be the largest human migration on the planet. So, expect large crowds at the most famous attractions. Book your travel during Chinese New Year months early — prices go up during the holiday season, and tickets get sold out quickly. 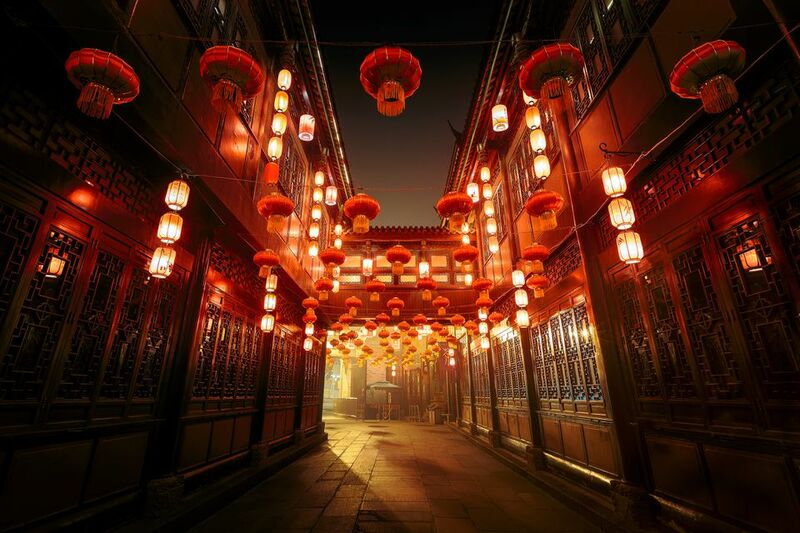 With all that in mind, it's still quite an experience to visit China during its most festive season! From the tourist's perspective, most business will be open for the holiday. Restaurants, tourist spots, hotels, airports, etc., all will be open and ready for business during Chinese New Year. Some restaurants might have limited hours over the holiday period, but for the most part, travelers are not going to have any trouble with tourist-related (service industry) places being closed over the Lunar New Year. The first 2-3 days of Chinese New Year are impacted the most by closures. The Chinese New Year holiday is actually 15 days long, but not every place closes for the duration. Predictably, the first two or three days of the holiday are the biggest and have the most impact. So for visitors who are traveling through, closures likely won't affect your trip other than if you need to exchange money or cash traveler's checks in banks. Using the ATMs to get local currency is a better plan. Note: If you're in China for a longer period and you were planning to have clothing custom-made (or furniture, bed linens, etc), then you'll find that the factory will be shut over the holiday period. Unless you pay to have it ready before the new year, you'll have to wait several weeks after the holiday for your items. The factories' suppliers will need time to get caught up with orders. You'll still be able to travel over Chinese New Year, but be prepared to pay higher fares and deal with bigger crowds. Outside the service industry, most workers have at least one week's time off of work. This translates into a mass exodus (the largest on earth) from major cities to smaller cities or the countryside as people return home to their families. Transportation is the busiest the week just before the holiday begins. The last days of the 15-day celebration are also very busy as people return back to the cities in which they work. Transportation actually isn't too busy the first day or two of Chinese New Year (most people are already where they want to be), however, celebrations will cause many street closures. Although tourist destinations are open for business, you'll find fares for all modes of transportation much more expensive. The top hotels will be booked. Be sure to make your bookings early (two to four months ahead is not a bad idea) to guarantee your choice of hotels wherever you're headed. Of course, last-minute arrangements can be made, just be prepared to pay a premium. It's absolutely possible to eat out during this time, but the rule is to book ahead. Many restaurants and hotels will have New Year's Eve specials, just like they did over the Christmas holidays. You should book reservations in advance if you're planning to dine somewhere special. You'll be able to see the fireworks any and everywhere! The pyrotechnics are unbelievable on Lunar New Year's Eve. Get yourself ensconced with a glass of champagne in a top-floor bar or lounge at a five-star hotel (you don't have to stay there to enjoy a drink). Make sure you have a window seat and possibly earplugs. At midnight, you'll feel like you're in the middle of a Steven Spielberg war movie as you'll hear firecrackers popping and rockets shooting in every direction. After you've enjoyed the view for a few minutes, take a walk and experience Chinese New Year at street level. Get an up close spot for the lion and dragon dances performed during special occasions. What's Your Chinese Zodiac Sign?